The Microsoft Answer for finding a needle in a haystack. It’s an age-old problem: Your company gets a lead on some business. In order to land the client, your company needs a proposal. Fred in sales writes the proposal, Sally edits it, Sol the lawyer makes his changes, and John pitches it. Three months later, when the client’s ready to sign, no one knows which version of the document is the latest, who has ownership of it, or where on Earth the actual file might have gone. Is it on Server1 or Server1001? On the Exchange Server? 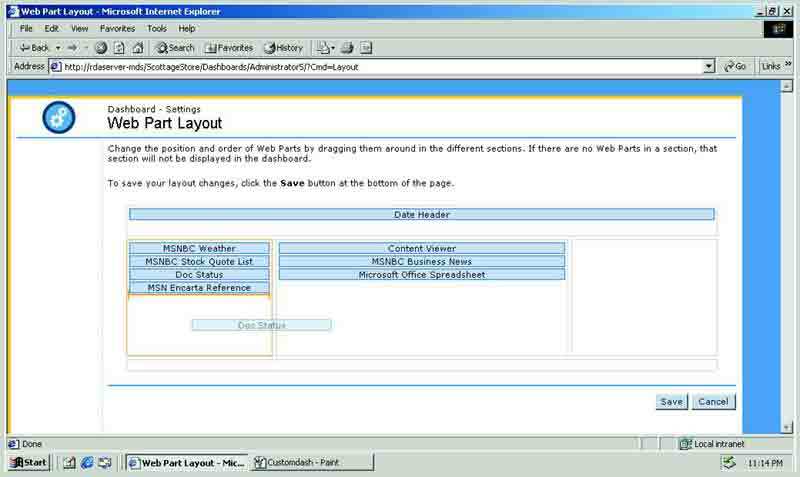 Enter Microsoft’s SharePoint Portal Server. The goal of SharePoint Portal Server (SPS) is to allow a company to centrally organize, index and search, and provide document collaboration services on all the files scattered in the enterprise environment. Let’s break down each of these features to see if SharePoint might be a good fit in your environment. First and foremost, SPS allows anyone in your company an easy point of access, or portal, to search for information. A portal is simply a “go-to” point in your network where users can look for stuff. SPS allows you to set this up in a number of ways. The simplest is to have one SPS server that maintains all the data on your network. This same server can be used to store data and present the data back to the user. Also, this server could be used to organize additional external data, such as links to a competitor’s Web site. This configuration is best for small environments, where one file server could be supplanted by one SPS server. However, it’s likely that many organizations will quickly outgrow the one-server SPS model. Those with larger environments might choose to have servers set up at various levels around the organization. While you could choose to have just one portal that encompasses your entire organization, you can split the duty among more specific portals to lighten each portal’s workload and make each server more specific in how it indexes information. Search and index servers can run on different servers, and multiple SPS servers can present a single unified view of information to your users. Once you have a basic understanding of how you might set up SPS, you’re ready to dig into what it can really do. Users will mostly interface with SPS when searching for some key piece of data in the nooks and crannies of your network. The good news is that SPS does an excellent job indexing the content you tell it to manage. Index and search for documents on its own. Index and search Exchange 2000 Public stores (but not mailboxes). SPS can index multiple Exchange 2000 servers. Index and search Exchange 5.5 Public stores (but not mailboxes), with the restriction that one SPS server can index only one Exchange 5.5 Server. Index and search Lotus Notes stores (4.6a and R5). Once SPS knows about the sources, it zips through each source and indexes them. This makes future keyword and context searches happen in a reasonable amount of time. By default, SPS will read through and index all Microsoft Office and HTML documents you point it at. Also, SPS has two secret superpowers when it comes to indexing. First, you can set up SPS so it can crack open TIF files and read the underlying text via Optical Character Recognition (OCR) technology and add them to the index for future searches. This is enormously helpful if you have use some kind of electronic fax gateway (i.e. jConnect, FACSys and so on) that receives faxes and you want to maintain their original quality, but enable the ability to store them in a searchable form. Users interact with the searching ability in SPS via a Microsoft Digital Dashboard interface, (Figure 1). The technology behind Digital Dashboards has been around since Outlook 98, but really hasn’t made a splash yet. SPS takes Digital Dashboards to the next level. downloads/Webparts/default.asp. Of course, developers are encouraged to create their own Web parts as they desire. At this point, the administrator can simply take business requirements from their users and design a dashboard. The interface for designing dashboards in SPS is revolutionary: A drag-and-drop Web page lets you just move the Web parts from one side of the screen to the other. Shown in Figure 2, this is one of the most beautiful design interfaces I’ve ever encountered. If your company is serious about going above and beyond some of the basics, consider spending some time over at www.microsoft.com/business/digitaldashboard. SharePoint is more than just an indexing service with shiny teeth and a pretty front end. It also has the ability to assist in tracking your most sensitive documents’ entire lifecycle. SPS can be used as the centralized repository for data when you need multiple people to be able to discuss a specific document and make proposed changes on it. Once the changes are approved, everyone can then be e-mailed and notified of the latest version. Also, multiple people can add their comments to the documents on the SPS server—ensuring that those who should have a voice about specific documents, do. SPS makes this magic happen with three specific technologies: the server’s special file system, SPS’s “Check in/Check out” technology, and a Microsoft Office client piece. SPS comes with the same file system that Exchange 2000 uses—IFS (Installable File System). With IFS, the number of properties a file can maintain increases. SPS takes advantage of this and permits SPS users to track major and minor revisions within a document and determine who has the file “checked in” or “checked out.” This is similar to borrowing a book from the library; only one person can have any document out at one time. This allows one person to maintain ownership of the file and guarantee no one else is actively making changes. However, SPS is smart enough to allow ongoing comments to be associated with the file when the author wishes to incorporate any suggested changes. People who generate content can simply check their documents into the server. Once they’re checked in, they’re fair game for comments from the peanut gallery, er, I mean users. 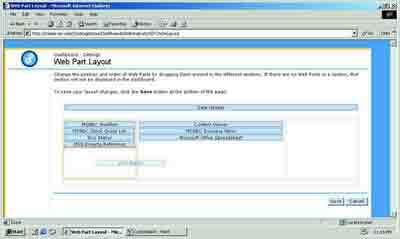 The client piece required to enable the magic is built into Office XP, but is a free add-on for Office 2000. To add the client piece to Office 2000, install the 14MB file from the SPS CD-ROM or deploy the file with Windows 2000 IntelliMirror. This versioning of files is a great feature, but remember it’s not available for every file on your network. It’s only going to be active for those files stored on the IFS file system that SPS controls. Do you need a way to enable your users to search through all the data on your servers? Do you need a way to help them collaborate on that data? SharePoint Portal Server may be the answer. It’s not that expensive, with a street price of around $7,000 for the server and 25 CALs. But you’ll need to factor in some of the soft costs. Your users will require a bit of training to get the hang of the check-in/check-out features. While you may be the one setting up the servers, it could be someone completely different maintaining the portals and the data. SPS comes with some scripts to perform backup and restore of the server. It’s an “all-or-nothing” proposition, which really doesn’t cut it should just one file go up in smoke. Thankfully, backup software vendors are beginning to ship SPS agents with their products. You should factor the cost of an SBS backup tool into your planning. The real costs come not in setting up the SharePoint Portal Server, but in the time it’s going to take to truly tailor it for your environment. SharePoint shines when you teach it a bit about your content and what your users search for. Couple that with some custom development for your “Ultimate Corporate Dashboard,” and you start to see some real investment in the product. Lastly, don’t forget that you’ll need to move those sensitive documents you want to version-control directly onto SPS servers. Someone’s going to have to actually read all that old stuff before making the decision to move old files to SPS or keep them where they are. But all in all, SharePoint Portal Server is an excellent product, which works as advertised to help tie all your corporate data together into one portal. Now, do you know where that sales proposal is?